← APA020: Where Can I Go Fishing? Well thank you for the question André, there is certainly lots more choice than thirty years ago when you would simply use the same rod for dead baiting, lure fishing, carping etc. Today you can buy a rod for every type of lure which has improved the quality of the presentation when the setup is correctly balanced. Lure rods can be anything from about 6 to 10 foot long. There has been a shift towards shorter rods of 180cm (6 foot) to 240cm (8 foot) in recent years. They are a lot shorter than bait casting rods, which are usually 11 to 12 foot long. Lure rods are designed to be carried and repeatedly used for casting either from the bank or a boat. They need to be light and easy to handle in tight spots, which gives shorter rods an advantage. If you want a rod to cast lures long distances from the bank then a longer rod will be required. The balance between the strength of the rod and the weight of the lure will also have to be correct. Please be aware that lures are difficult to control when casting a long distance. You quickly lose accuracy and increase the chance of hitting trees and snags. How you plan to store and carry a rod is another aspect to consider when making a choice. A one piece jerkbait rod will be 6 foot long. The majority of lure rods come in two pieces. Travel rods come in three, four or more sections so they can fit into a suitcase, which is handy if you plan to take the rod abroad. A telescopic rod will usually be much cheaper and, in my experience, they don’t last very long, so I would give these a miss. Shorter, stiffer lure rods are better for working heavy lures and jerkbaits and for using in a boat. The action on Jerkbait is imparted by the angler jerking the rod tip to yank, tap or jerk the lure from side to side. The lure is stationary (rests) between jerks. A soft, whippy rod would not be able to achieve this very well. 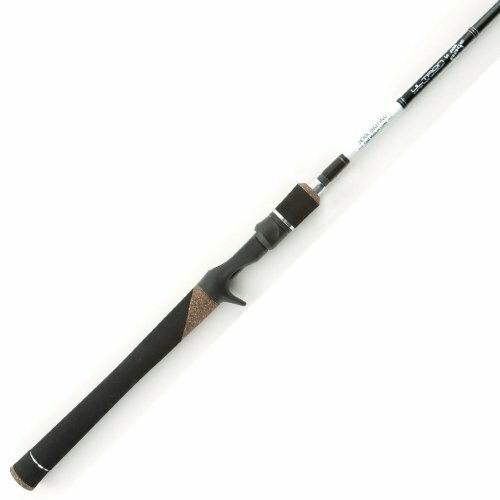 Specialist jerkbait rods are 180cm to 190cm long and often have a trigger grip. They are usually matched with a multiplier reel which should be loaded with braided line. The multiplier sits on top of the rod when you are holding it. You need a braided line that doesn’t stretch when you are jerking the lure with the rod. The action on these lures is mostly gained from simply winding in the lure. A stop start retrieve will let the lure sink or rise (depending on the style of lure) in between bursts forward. The wiggle and vibration comes as water passes over the bib or tail of the lure. Lure rods usually have a standard reel seat and are matched to a fixed spool reel loaded with braided main line. Trigger grips and multipliers can take a bit of getting used to and are favoured by the experienced and ultra-keen lure anglers. I would stick to fixed spool reel when just starting out. Although there really isn’t one single rod that will fit the bill perfectly for all of the types of lures, there are rods that will do a good job in a range of situations. A longer rod will improve the casting distance and accuracy of the lure. The weight rating indicates the strength of the rod and therefore the size of lures suited to it. A 10g to 35g rating will be ideal for spinners and small lures. For medium sized lures you should look for a 20g to 50g rating or similar. If it’s the larger lures you are wanting to use then you could step up to 30g to 80g or similar. There will, of course, be some cross over in the sizes of lures you can use with each rod. This does not mean you can use a large softbait on a light lure rod. You wouldn’t be able to cast far enough or control the retrieve very well. Plus you are likely to end up with a broken rod. I also recommend that you go to your local tackle shop or megastore and pick up a few rods. See how they feel in the hand. Look at the quality. Ask the sales people for their advice. I hope this has helped you André. Thanks for the question and good luck with the lure fishing.